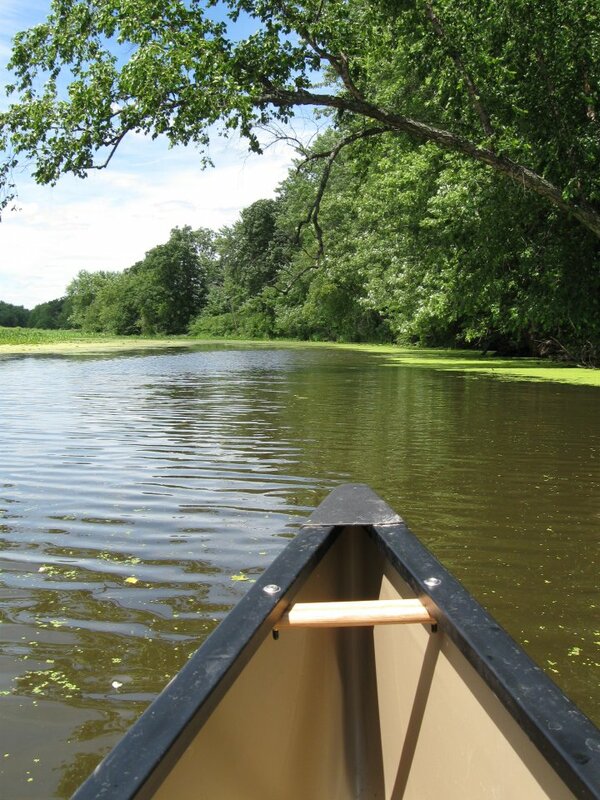 This 11 mile marked Canoe Trail is recommended for experienced paddlers. It can be quite difficult because of length and since paddlers will be going against the current in the beginning. Many paddlers choose to go upriver 5-6 miles and then return, flowing with the current back to the Verchota boat landing. Location: In the Upper Mississippi River National Wildlife and Fish Refuge, near Winona, MN. From Winona, MN, take the River Road to Prairie Island Campground, travel .5 miles to boat landing. Paddling on the Mississippi River is quite enticing but also challenging. Refuge Staff often hear, "Will I get lost in the backwater sloughs? How will I find my way out?" This 11.2 mile challenging trail is posted for counter-clockwise travel. It is best for stronger, experienced paddlers, as there is a lot of upstream paddling and the current can be strong. During low water, rock obstructions are exposed and paddlers may need to portage. Trails users also may wish to enter and explore the slow/no wake and electric motor areas. The canoe trail on the Upper Mississippi River National Wildlife and Fish Refuge offers an experience to explore off the main commercial navigation channel. The slower current, lotus beds and side channels offer an experience reminiscent of the days of Tom Sawyer and Huck Finn. The slower pace allows a paddler to view bald eagles soaring and resting in cottonwoods along the shore. Trail users traveling in spring and fall experience bird migration. Early spring allows paddling before the water plants grow. 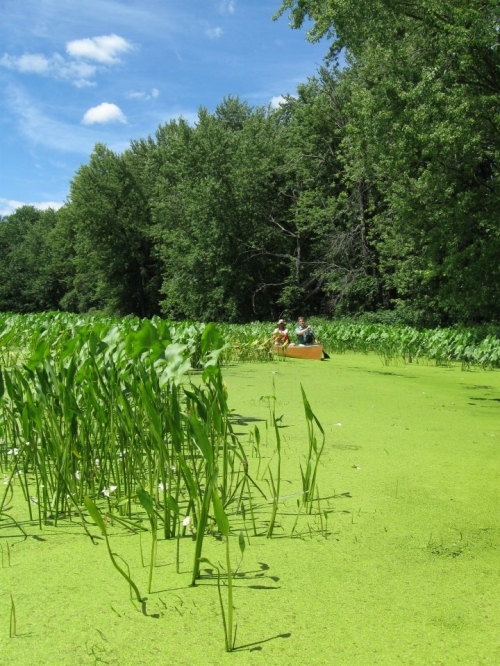 The hot summers along the Mississippi means hardy paddlers will need to push canoes or kayaks through the beds of lotus. Every season offers the river paddler an experience to immerse themselves in the Upper Mississippi River National Wildlife and Fish Refuge. which stretches along the Mississippi River and includes Districts in Minnesota, Iowa, Wisconsin and Illinois. The Refuge is part of the Upper Mississippi River National Wildlife Refuge Complex, which also includes Trempealeau National Wildlife Refuge in Wisconsin and Driftless Area National Wildlife Refuge in Iowa. Established in 1924, the 240,000-acre Upper Mississippi River National Wildlife and Fish Refuge covers 261 miles of the River valley from Wabasha, Minnesota, to Rock Island, Illinois. The Refuge is divided into four districts, the Savanna District, the Winona District, the McGregor District, and the La Crosse District. The Refuge includes broad pools, islands, braided channels, extensive bottomland forest, floodplain marshes and occasional sand prairie. These habitats are critical to mammals, waterfowl, songbirds and raptors, amphibians and reptiles. More than 250 Bald Eagle nests and a yearly average of 15 active Heron colonies with a total of 5,000 nests exist on the Refuge. The Refuge and the River support 119 fish species that support a strong commercial and recreational fishery. -Always wear a properly fitted personal flotation device (PFD). -Tell someone where you will put in, take out, and your return time. -Thunderstorms can develop quickly. Check the weather forecast before heading onto the water. If a storm approaches, get off the water. -There are no restrictions to where canoes can go on Mississippi River backwaters. If you feel comfortable, explore off trail. -Be aware of river traffic. Motorboats and barges can throw large waves which can swamp a canoe. -Some areas along canoe trails are popular with hunters. Be extra cautious when canoeing during hunting seasons. -Make yourself visible - wear bright colors, put reflective tape on your paddle or boat, carry a light and whistle. -The bluffs can “tunnel” the wind making it stronger and causing more waves, especially in open areas. -Be aware of currents. If you begin moving too fast, paddle toward the shore. -Backwaters can be dangerous if the water is high and the current is flowing through log jams, snags and low hanging branches. -Scout ahead for possible hazards and portage areas.